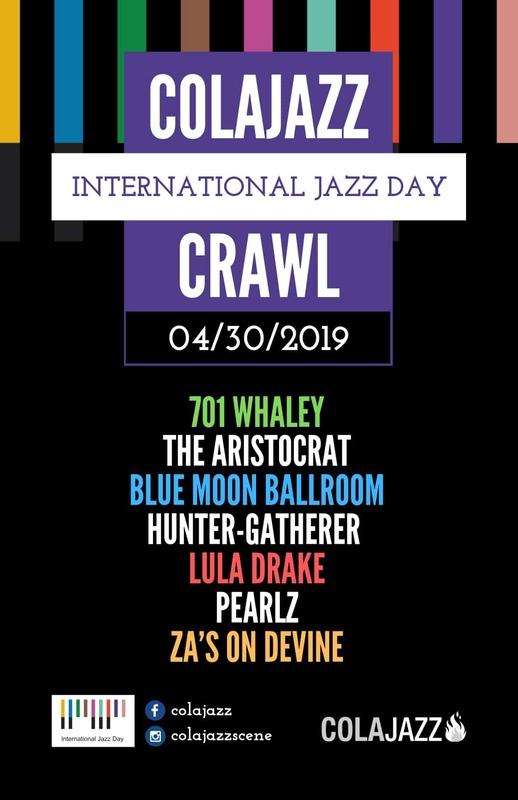 ColaJazz presents a new annual tradition, The ColaJazz Crawl, celebrating International Jazz Day on Tuesday, April 30th! Experience one amazing night of internationally rich jazz in your favorite venues filled with local to international musicians! This epic #jazzday event happens once a year and we’ve programmed one amazing night of internationally rich jazz! From the fiery, exciting Cuban jazz presented by Gino Castillo at 701 Whaley to a jazzy japanese flute-led quartet at The Aristocrat to the always hip jazz jam at Hunter-Gatherer Brewery & Alehouse to a burning session in a cool lounge overlooking The Vista at Pearlz Oyster Bar Columbia!